Fall is almost here and with it comes apple picking, leaf peeping and state fairs. DEP has had a presence at some of the fairs across the state and will be returning to the Common Ground Fair this year with a focus on recycling. After a busy summer, here at DEP, I hope you will visit us at the fair as well as take some time with family and friends to enjoy the natural beauty of Maine. The first session of the 128th Legislature proved to be a lengthy and memorable one. 1647 bills were introduced for consideration by the Legislature, DEP tracked over 100 bills and served as the lead agency for 48 of them. Some of the major topics of interest to the Environment and Natural Resources Committee (ENR) and DEP were mining, product stewardship, preparing beaches and coastal zones for sea-level rise and storm surge. Mining was one of the most prominent issues brought before ENR this session. Eight bills were introduced ranging from a total ban on all Metallic Mineral Mining (LD 160 An Act To Prohibit the Mining of Massive Sulfide Ore Deposits under the Maine Metallic Mineral Mining Act), to rules proposed by the Department (LD 395 Resolve, Regarding Legislative Review of Chapter 200: Metallic Mineral Exploration, Advanced Exploration and Mining, a Major Substantive Rule of the Department of Environmental Protection), which tried to put in place strong environmental protections while still leaving the door open to responsible mining activities. After much debate, a compromise was agreed upon using much of the hard work the Department had already done on the Chapter 200 rule as a basis for the new statute. LD 820 (Public Law 2017 Chapter 142), An Act To Protect Maine's Clean Water and Taxpayers from Mining Pollution, directs the Department to incorporate specific changes listed in the law into the Chapter 200 rule. These changes include more stringent financial assurance requirements; banning open pit mining, wet tailings, and mining in or on state land listed in Title 12 section 549-B; and restrictions on mining in, on and under a water body. Stewardship continues to be a subject that sparks great debate among ENR Committee members. Perennial bills attempting to properly regulate the disposal of single-use plastic bags (LD 57), polystyrene containers (LD 103), batteries (LD 385), and of course bottles (LD 56 and 683) were heard this session, as well as proposals regarding two newcomers: mattresses (LD 349) and carpet waste (LD 375). The Committee was ultimately unable to reach agreement on any of the bills listed above for several reasons, including the cost to consumers and businesses and the lack of infrastructure to support the programs. The Committee did reach agreement on two bottle-related bills: LD 227 (Public Law 2017 Chapter 10), An Act To Exclude Cardboard Beverage Containers from the Laws Governing Returnable Beverage Containers and LD 56 (Public Law 2017 Chapter 140), An Act To Include 50 Milliliter and Smaller Liquor Bottles in the Laws Governing Returnable Containers. LD 56 was one of the most heavily publicized bills the Committee considered this session. The bill was presented to address a growing concern that “nips”, miniature single-serving bottles of alcoholic beverages projected to reach sales of over 12 million in 2018, were becoming a growing litter problem for the state. To address this issue, the bill removed the existing exemption and placed a 5-cent deposit on them. Three bills were introduced this session regarding Beach and Coastal Zone issues: LD 540, An Act To Help Municipalities Prepare for Sea Level Rise, LD 739, An Act To Improve Beach-cast Seaweed Management for Health, Ecology and Tourism, and LD 1095, An Act To Establish the Maine Coastal Risks and Hazards Commission. The ENR committee was not able to reach consensus on these bills and agreed to carryover LD 1095 until next session in anticipation of a briefing from the MICA -Maine Interagency Climate Adaption Workgroup as well as results from a symposium to be organized by Maine Municipal Association. As we prepare for the second legislative session, I want to thank all of you who assisted us with our efforts at the State House this past year. 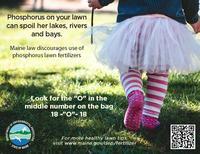 Most soils in Maine naturally have enough phosphorus to keep a lawn lush and green so if you use fertilizer, make sure it is phosphorus-free (noted by the “O” in the middle number describing the fertilizer blend). Only use phosphorus when establishing a new lawn, re-seeding or when recommended by a soil test from a lab. Maine has chosen to empower retailers and educate consumers by requiring stores that sell fertilizer to post signs explaining when it is appropriate to use fertilizers with phosphorus. For more information on responsible lawn care, visit the Maine DEP Phosphorus-free Fertilizer webpage. Maine has a water classification system that establishes water quality goals for the State. The system is used to direct the State in the management of its surface waters, protect the quality of those waters for their intended management purposes, and where standards are not achieved, direct the State to enhance the quality to achieve those purposes. The classification standards establish designated uses and related characteristics, criteria necessary to protect the uses, and specific conditions for certain activities such as the discharge of wastewater. There are four classes for freshwater rivers and streams (AA, A, B, C), three classes for marine and estuarine waters (SA, SB, SC), and one class for lakes and ponds (GPA). A close comparison of the standards shows that there is not much difference between the uses or the qualities of the various classes. All attain the minimum fishable-swimmable standards established in the federal Clean Water Act. Most support the same set of designated uses with some modest variations in their description. Under Maine statute (38 M.R.S. Sections 464(2), (2-A) and (3)) DEP is required to periodically conduct water quality studies, and the Board of Environmental Protection to hold hearings and propose changes to the water classification system to the Legislature for final approval. The last comprehensive round of re-classifications was completed in 2009. On August 1, 2017 DEP began the process to prepare a Water Quality Re-Classification proposal for the 129th Legislature by e-mailing a request to submit proposals on changes to the classification of specific surface waters to interested parties. Submission guidelines including a timetable were included in the mailing. A public review process of proposed changes will be conducted through the first half of 2018 with stakeholder meetings and a public hearing by the Board of Environmental Protection anticipated by mid-summer of 2018. Questions regarding the current Re-Classification initiative may be directed at Susanne Meidel. George MacDonald, Sustainability Director in the Land Resources Bureau has received word that he is being recognized by the Northeast Recycling Council (NERC) for his tremendous work and support of the organization. George will be awarded "The Involvement in NERC Award - Public Sector" at NERC's 30th Anniversary Conference and Celebration to be held in November in Amherst, MA. We extend our best wishes to George on this well-deserved recognition. GOMAINE.org is where you can find free, money-saving, energy efficient commuting solutions. GO MAINE is the statewide commuter services program sponsored by MaineDOT and the Maine Turnpike Authority. From Kittery to Fort Kent, we develop commuter programs that help Mainers get to work and save big money on the way! GO MAINE helps commuters just like you save thousands of dollars in commuting costs every year by helping you find someone with whom to carpool or vanpool to work. In July, the U.S. Environmental Protection Agency (EPA) recognized the recipients of nine Brownfields grants in Maine. This year, entities in Maine will receive $2.7 million for assessment and cleanup of Brownfields sites. "EPA is committed to working with communities to redevelop Brownfields sites which have plagued their neighborhoods. EPA's Assessment and Cleanup grants target communities that are economically disadvantaged and include places where environmental cleanup and new jobs are most needed," said EPA Administrator Scott Pruitt. "These grants leverage considerable infrastructure and other investments, improving local economies and creating an environment where jobs can grow." "Brownfields redevelopment has had a major impact on Maine’s economy and environment," said Maine DEP Commissioner Paul Mercer. "We are grateful to EPA for making the funds available to Maine and encourage establishments who are interested in the program to contact DEP and work with our staff."